Using Coffee Grounds Correctly | Gardens Alive! Question. I don't put much 'green' material in my 12'x7'x4' compost pile; just a lot of coffee grounds. (We drink a LOT of coffee!) Is there a recommended limit? I don't want my plants to OD on nitrogen (or caffeine!). ---Ken; just outside of Philadelphia, PA. I am spreading coffee grounds from the local Bagelsmith under my five-year old pines and spruces with the idea that it will acidify my lousy clay soil. 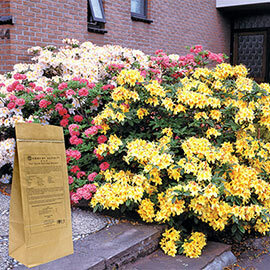 Based on a number of enthusiastic 'testimonials' on a recycling website I have spread several bushels of grounds so far. Am I deluded? Worse, am I doing harm? Answer. First, a few extraneous words to Craig up in Alaska: I know that many uninformed sources advise using shredded newspapers and cardboard as the 'dry browns' in a compost pile, but: 1) newspaper ink is more toxic than these people realize; 2) newsprint is bleached, creating cancer-causing dioxins; and 3) cardboard contains nasty glues and other chemical 'fillers'. More importantly, these things contain zero nutrition for your plants. If you don't have enough leaves, experiment with wood shavings or sawdust. 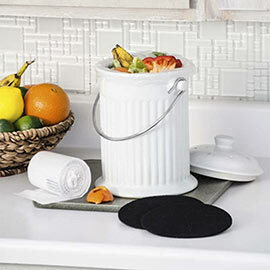 They can be difficult to compost, but are far superior to heavily processed paper products. Now, on to coffee grounds! When we first started doing this show, we warned people to only spread coffee grounds around acid-loving plants, like azaleas, rhododendrons and blueberries, because the grounds were bound to be acidic; and not to overdo it on those and other flowering plants, as the grounds were certainly high in Nitrogen, which makes plants grow big, but can inhibit the numbers of flowers and fruits. But then we were sent some test results that showed grounds to be neutral on the pH scale! To find out what gives, I called Will Brinton, founder and Director of the Wood's End Research Laboratory in Maine, the definitive testers of soils, composts, and raw ingredients used in large-scale composting. Will solved the mystery instantly. Woods End, it turned out, was the source of that neutral test! Ah, but some follow-up investigation later revealed that it hadn't been coffee grounds alone, as the person submitting the material for testing had stated, but grounds mixed with raw yard waste, the classic 'dry brown' material that is the heart of a good compost pile. It turns out, as expected, that "coffee grounds alone are highly acidic," says Will, who saved all the grounds from his Lab's break room for a week recently just to test for us ("Eight o' Clock" coffee, which I remember fondly from our old A & P neighborhood supermarket). 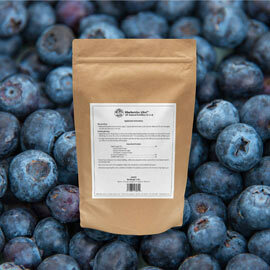 They came out at 5.1, a perfect low-end pH for plants like blueberries that thrive in very acidic soil. "But that's the most gentle result we've ever found," Will quickly added, explaining that the other 31 samples of raw coffee grounds they've tested over the years all had a pH below 5, too acidic for even some of the so-called acid loving plants. But I had to quickly sputter that I never recommend adding anything to raw ingredients before composting for fear of upsetting the apple—eh, compost—cart. "Neither do I," said Will; "this is a unique situation." And he certainly doesn't think grounds should be used in their raw form. First, he explains, they are so acidic and so Nitrogen rich that you risk creating a 'mold bloom' where you spread them. And second? "There's no life in those grounds; its all been boiled or perked away." Instead, he suggests doing what the guy with that original sample did—adding the grounds to microbe-rich yard waste and composting that perfect combination. Will liked my suggestion of four parts shredded leaves to one part grounds by weight, but adds that even having grounds make up 10% of a pile of otherwise shredded leaves would create great compost. So mix those coffee grounds in with some lime or wood ash and then into lots of shredded leaves; you'll make a fine, high-quality compost. The only exception I can think of is our listeners out West cursed with highly alkaline soil; you could try tilling in some grounds alone and see if it moves your nasty soil towards neutral with no ill effects. Otherwise, we can't recommend their raw use; the acidity could be high enough to damage even acid-loving plants. And yes, this means that our poor New Jersey listener could be harming his plants with all that uncomposted coffee. Unfortunately for him, Northeast soils are ALREADY acidic; that's why many homeowners in the North lime their lawns. And when I scrolled through those 'testimonials' that so swayed him, I noticed that they all seemed to be from California, where the soils are highly alkaline. And you can't improve clay soil by making it more acidic or alkaline; the only way to REALLY improve clay soil is to dig it up and toss it into the woods!.